Shenzhen, China-based Insta360 has launched its most powerful professional-grade 360-degree VR camera that aims to make life easier for VR content creators. Named Insta360 Pro 2, the new camera offers a huge performance bump over its predecessor and simplifies a filmmaker’s VR production workflow right from start to finish. The Insta360 Pro 2 packs six fisheye cameras, each of which is capable of shooting at 8K resolution with 3D depth sensors. Though 2K is good enough for smartphones and 4K for TV screens, the 8K resolution is required for 360-degree VR footage to offer an immersive experience while viewing with VR goggles. The Insta360 Pro 2 uses all its six cameras to record every angle of a scene simultaneously. It then combines them into 8K-per-eye 3D 360-degree virtual reality footage. The spherical-shaped machine is also capable of 360-degree live streaming in 4K resolution while recording 8K content at the same time. Filmmakers have a wide range of shooting modes to choose from: 8K monoscopic at 60fps, 8K 3D at 30fps, 6K 3D at 60fps, and 4K 3D at 120fps. At just 3.42 pounds including the battery and top-mounted antennae, it’s portable and easy to carry around or send up on a drone. It has four mics, and a pair of 3.5mm and USB inputs at the top and bottom. It also has six microSD card slots – one for each camera. There is also a seventh microSD card slot for low-res proxy files and stabilization data. The camera also features a built-in GPS module. Video creators have often complained that lighting in a scene could differ depending on the angle you are looking. Insta360 Pro 2 addresses this problem with its in-camera HDR, which ensures that the lighting is even and natural in every direction in the resulting photos and videos. And then there is the i-Log mode that offers you flexibility in post-production coloring. Another major pain point that Insta360 Pro 2 addresses is the in-camera stabilization. Most of the VR content available today is poorly stabilized, making viewers sick. The Insta360 Pro 2 has something called FlowState stabilization that offers gimbal-level stabilization without requiring any bulky stabilization equipment. It relies on an ultra-precise gyroscope that tracks the camera’s motion on nine different axes. If you want further stabilization, Insta360’s software will help you stabilize the footage “down to a hair” during post-production. The Chinese company added that their new device also makes dynamic, moving shots possible in virtual reality. It also offers a better alternative to WiFi monitoring that filmmakers rely on to direct a shot when they can’t be on the set. WiFi monitoring has a short range, and is often unreliable. The Insta360 Pro 2 comes with FarSight technology for 360-degree live monitoring with a low-latency, high-definition optimized for long-distance previewing. With the help of a 5.18GHz transmitter and receiver, it enables filmmakers to view and direct their scenes from a distance of up to 300 meters ground-to-ground and 1000 meters ground-to-air. The Chinese company has partnered with Adobe to dramatically reduce the workflow. When you capture a video using the Insta360 Pro 2, it saves the full-quality footage as well as a low-resolution proxy version. After you’ve finished shooting, import the footage into Adobe Premiere Pro. It will automatically recognize the low-res proxy files and stitch them instantly so you can preview your final project. Finally, the Pro 2 has a CrystalView technology that converts footage into an 8K quality format ready for viewing even on VR headsets and smartphones. It’s particularly useful because most viewers watch content on VR headsets or smartphones that have 4K or lower resolution. CrystalView ensures 8K quality footage even on these devices. 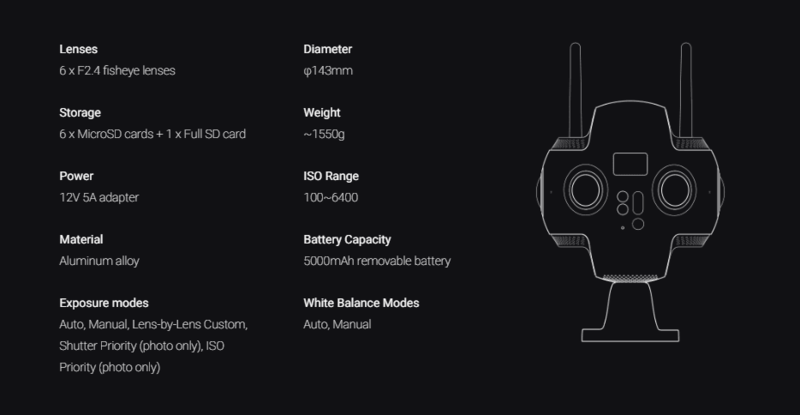 Insta360 has already started accepting pre-orders for the new camera through its website. You can also pre-order it at B&H Photo Video outlets and select other retailers worldwide. Insta360 will start shipping it to customers in September. The camera is priced at $5,000, which includes one battery and the FarSight transmitter system. The device is meant for professionals, and its price tag is not too high. Its alternatives such as Nokia Ozo costs $60,000 and GoPro Odyssey sells for $15,000.